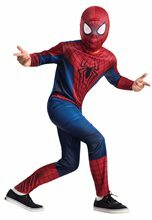 Become your favorite comic book hero in this Spider-Man Classic Black Suit costume featuring black Spider-Man jumpsuit with character hood.Spider-Man Classic Black Suit.Includes: Jumpsuit with character hood.Available Size: Boys - Small (4-6), Boys - Medium (7-8). 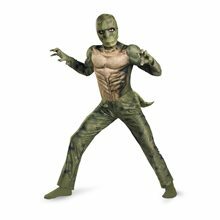 *Socks Not Included.Material: 100% Polyester.Care Instructions: Hand Wash Cold. Do Not Bleach. Line Dry. Cool Iron If Needed. 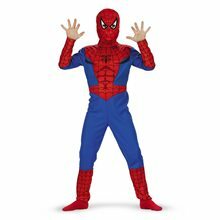 Do Not Dry Clean. 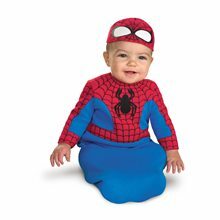 Hot off the spider-Man 3 movie this costume fits 0-6 months it also includes bodysuit and half hood with large eye opening. 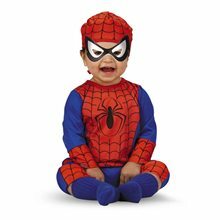 Deluxe Goblin Child Costume.Includes: One jumpsuit with attached shoulder pades, belt and mask.Available Size: Boys - Small (4-6), Boys - Medium (7-10), Boys - Large (10-12). 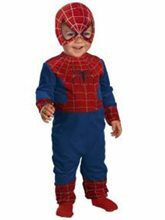 (See Size Chart For More Information)*Shoes and Weapon Not Included.Child New Goblin Quality Costume Deluxe Goblin costume includes Jumpsuit with attached shoulder pads, belt and mask.